Pride Auto Care does FREE check engine light (CEL) readings! For 20+ years, Pride Auto Care has had veteran ASE-certified Master Techs reading and diagnosing check engine lights for virtually every make and model of car and light truck made; and then making the necessary repairs if needed. Vehicle manufacturers don’t make “Check Engine Lights” and other dash warning lights amber and red for no reason! 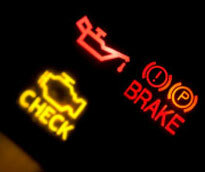 Generally, check engine lights should be looked at immediately or at least sooner rather than later. Obviously, if the vehicle’s performance has diminished or it’s just running poorly, get it in right away. Refer to your owner’s manual for more detailed information. See our coupon page for money saving ideas. Pride Auto Care has built a solid 20+ year reputation on servicing virtually every engine component out there! We have trained techs using the current scan tools, current manufacturer’s data, OE (original equipment) specifications, wiring schematics, system diagrams and diagnostic trouble-shooting data available. 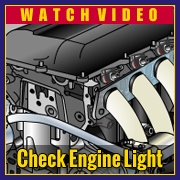 Essentially, the check engine lights are meant to get your attention and give you a heads up to a potential problem with one or more of your car’s onboard systems. Oftentimes, the CEL is easy to fix. Other times they can indicate something more serious. But for all the money we have invested in our cars today, NOT having a CEL checked could mean serious problems now or later on. At Pride Auto Care, if it’s a benign or non-critical light, we’ll reset it for free and get you on your way. If the CEL comes on again, get your car back in for some further diagnostic time and we will find out what’s driving the check engine light issue and be able to fix it for you. In 1996, an orange light on your car’s dashboard labeled “Check Engine” or “Service Engine Soon” became standard on all car makes and models. The light tells you there’s a problem with your car’s engine, powertrain control or other vehicle systems. What does the “Check Engine” Light mean? An illuminated “Check Engine” or “Service Engine Soon” light indicates a problem detected by our car’s onboard diagnostic system (OBD). The light cannot indicate the exact nature of the problem – only the right training and diagnostic equipment can do that. A technician connects a “scan tool” to your car’s onboard diagnostic system to determine the problem. Further testing and diagnostics may be required to pinpoint the exact cause of the problem.